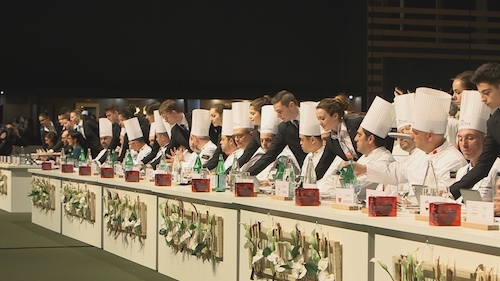 Behold, French gastronomy’s high mass: Sirha. Every two years, two hundred thousand visitors, three thousand exhibitors and all the great names of French cuisine come together in Lyon, native city of the father of them all, Paul Bocuse, who died last year. Culinary innovations, sweetmeats, convenience, quality of execution, everything possible is done to whet the appetite in the show’s seven halls dedicated to this World Fair of cooking. What’s at stake for the exhibitors, how do you grab attention amidst the latest trends? We accompanied the inventors of some astonishing products, such as seaweed-based bubbles that can encapsulate vinegar, fig syrup, rum or sweet wines to provide an explosion of taste in the mouth, the latest major trend. But you will also discover that outstanding products of high gastronomy, like caviar, must also be presented in surprising ways. Eat better, while respecting one’s health and the environment, developing vegetarian products… all trends cross paths here. Special visitors also visit Sirha, people like restaurant owner Hervé Fourière, a chef from Nantes, who wants to revitalize his menus or managers of restaurant chains or shops. All are seeking fresh tastes along the aisles in order to restyle their offer in tune with the current fashion. We’ll see that daily “innovation tours” are organized for these special visitors. But Sirha is also the setting for twenty-four major Golden Bocuse awards, from the pastry maker world cup to the best oyster opener, judged for his speed. A plunge into Sirha for a major Format 66 minutes.